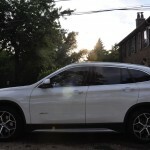 We loved the previous X1. Lets just get that out of the way. 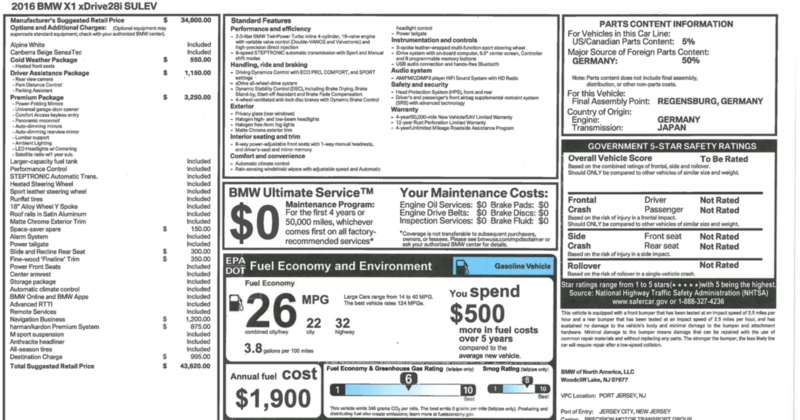 It was the last BMW with non-electrically assisted steering and the last E90 3 Series derivative sold. It was rear wheel drive based and felt as much a tall wagon as a crossover. That last part which so appealed to us and many of you was exactly what didn’t appeal to most. 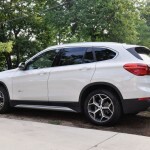 Due to this when BMW went to redesign the X1 they starting with a MINI shaped blank piece of paper. Two reasons. 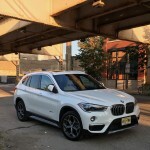 First BMW decided that the X1 needed to be about appealing to a wider audience that cared more for load capacity, utility and pricing than weight balance and feedback. 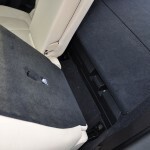 A front wheel drive platform would help tremendously. 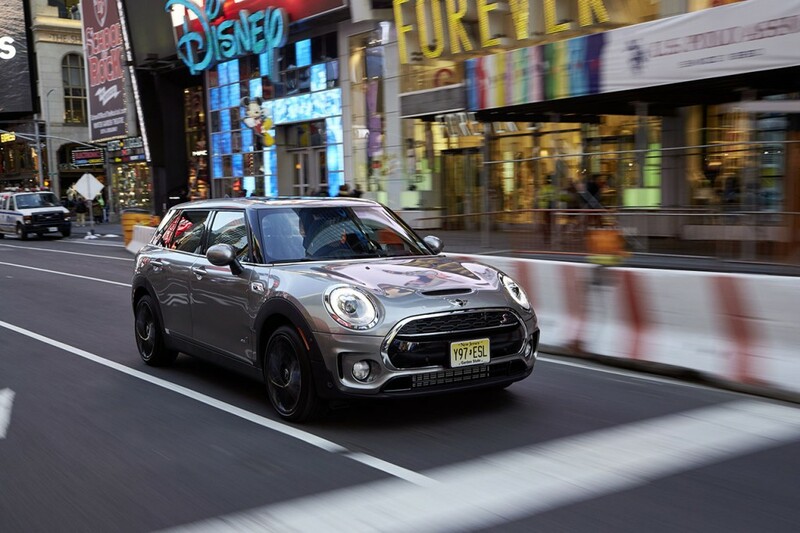 Second BMW needed to dramatically increase production scale for the front wheel drive MINI in order for the brand to be profitable. 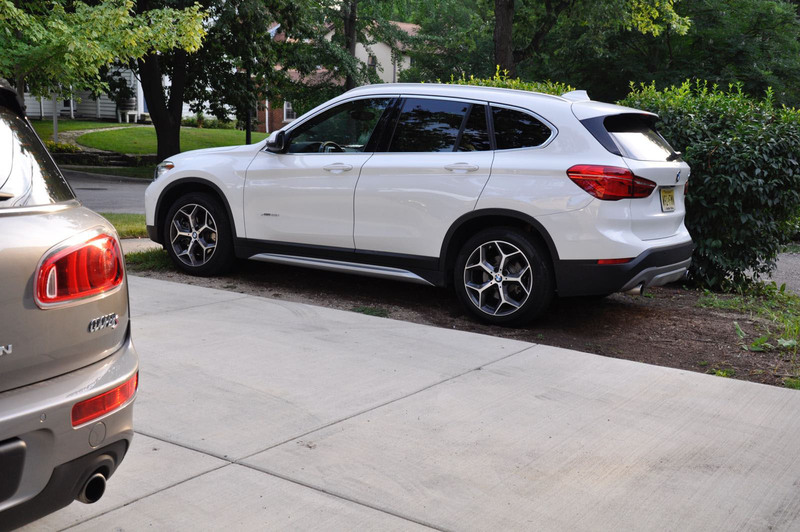 So they decided to double down on small front wheel drive cars with the X1 being on the large end of that plan. 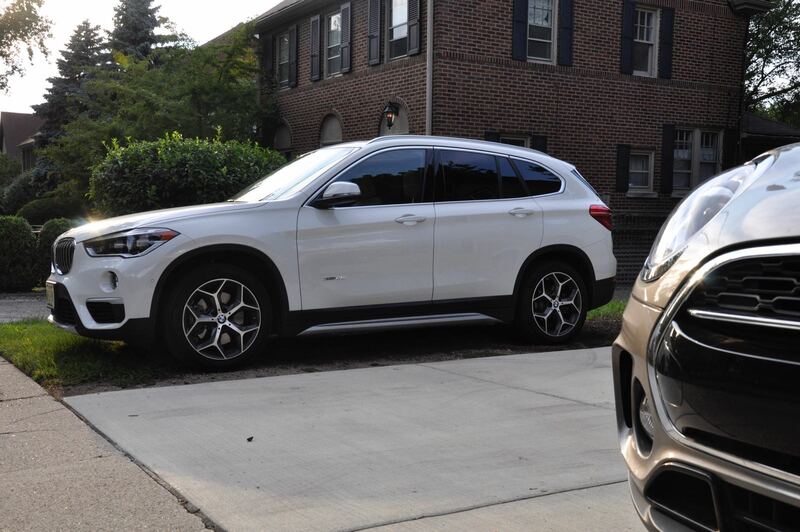 The first thing you notice about the new X1 are the looks. They’re much more generic this time around than the previous E90 3 Series based version. 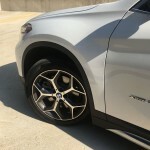 There’s a bland crossover look to the shape as well as the styling details. 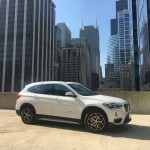 So much so that even my 4 y/o son pointed it out when he kept telling Mazda CX5s, Suburu Foresters and Hyundai Tuscons looked just like the X1. 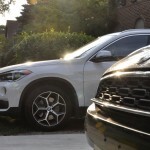 Looking around the Starbucks parking lot reveals that that list is just the start – the new X1 look so a lot like other front wheel drive based crossovers. BMW knew this and in fact have embraced it. 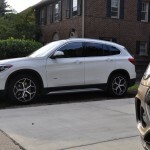 Gone is the tall wagon feel of the previous X1. 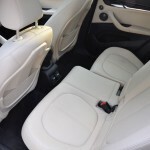 Gone too are the excellent driving dynamics and rear wheel drive based architecture. 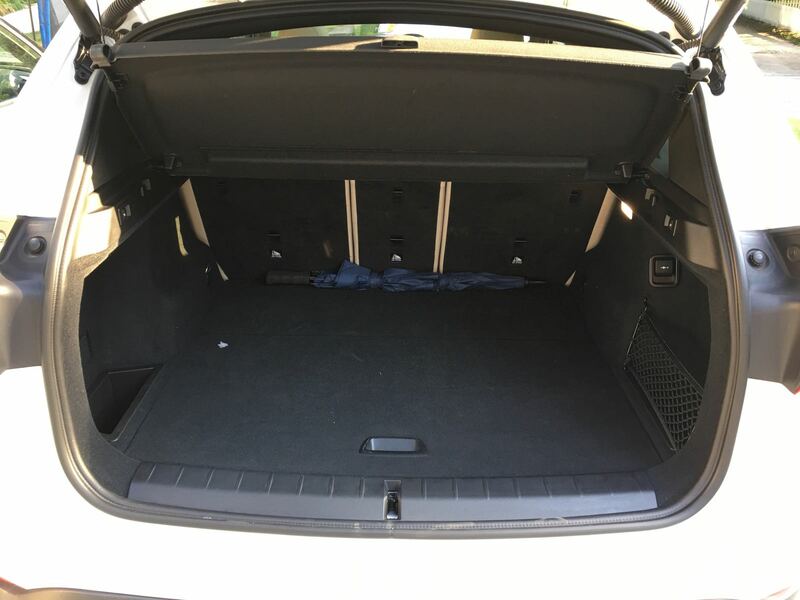 In its place a smaller vehicle with more interior room, less weight and less power. 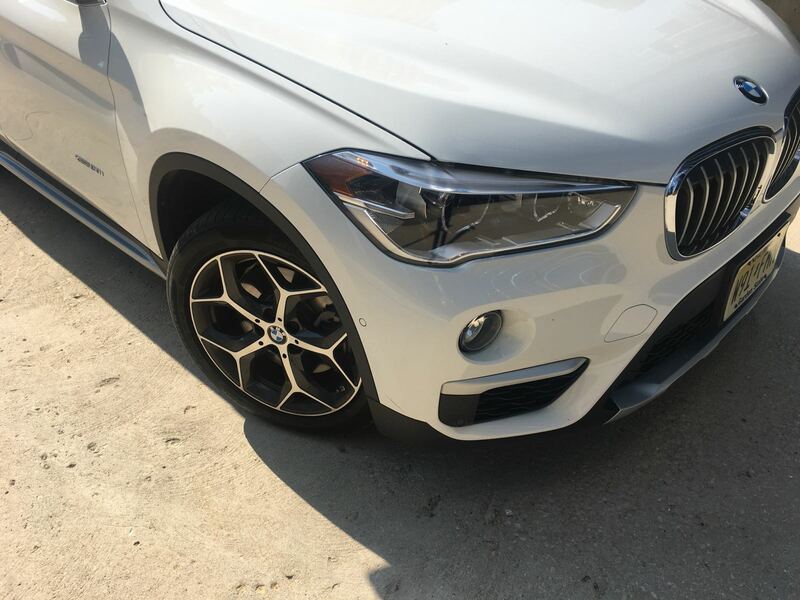 Oh and a generic BMW look wrapped around a generic small crossover shape. The MINI Clubman on the other hand is full of character. On American roads there’s simply nothing else like it. More wagon-like in its approach, the Clubman feels like the anti-crossover in a lot of ways boasting similar levels of space with a lower, more responsive driving experience. Compared with other MINIs the Clubman has by far the most comfortable and controlled ride we’ve ever felt. Driving the car on old midwestern highways in comfort mode, expansion joints almost disappear entirely. Likewise the wider track contributes to this more grown-up feel by increasing the stability of the car at highway speeds. All told this is by far MINI’s best highway cruiser. 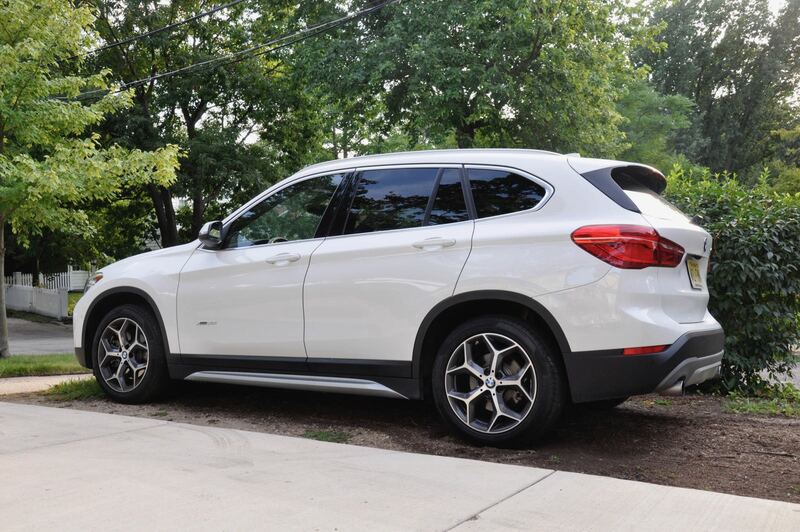 The X1 has even more isolation and thus feels more refined at highway speeds. 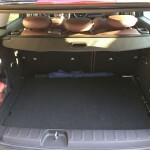 It’s also slightly more comfortable than the Clubman but not by much. Most of that is due to the softer spring settings and less aggressive anti-rollbars on the standard X1. 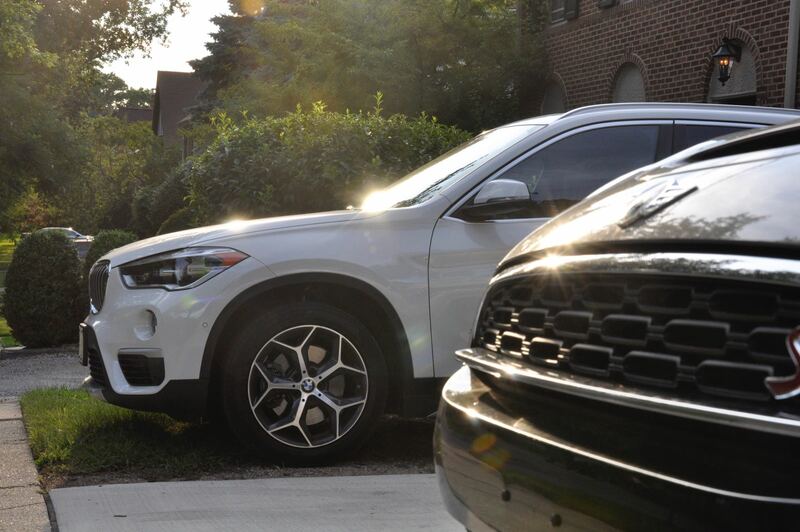 In the corners the extra weight of the X1 is evident in the way it responds to inputs compared to our long term Clubman Cooper S. The X1 28i xDrive is 3,660 lbs compared to our front wheel drive Clubman Cooper S at 3,235 lbs – a substantial 425 lbs difference. 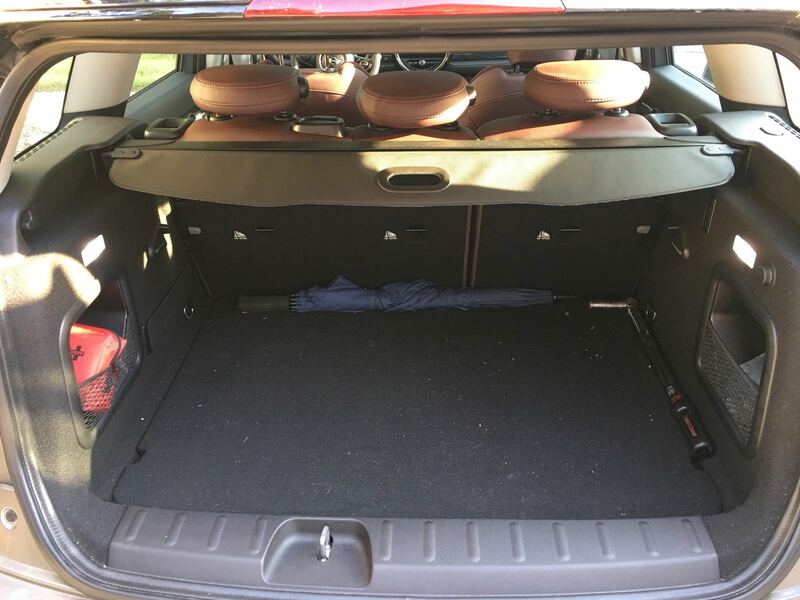 In comparing the new Clubman Cooper S All4 to the X1 things get closer but the Clubman is still 215 lbs lighter at 3,445 lbs. 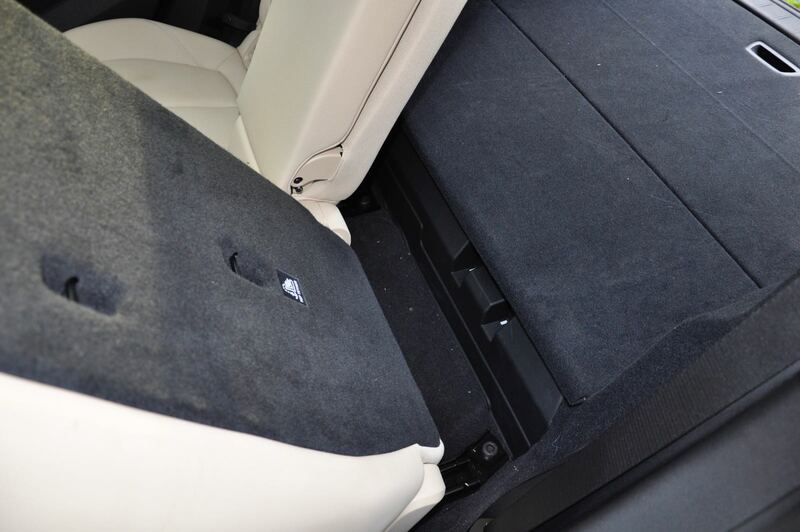 but it’s not just weight that makes the Clubman feel more lively. 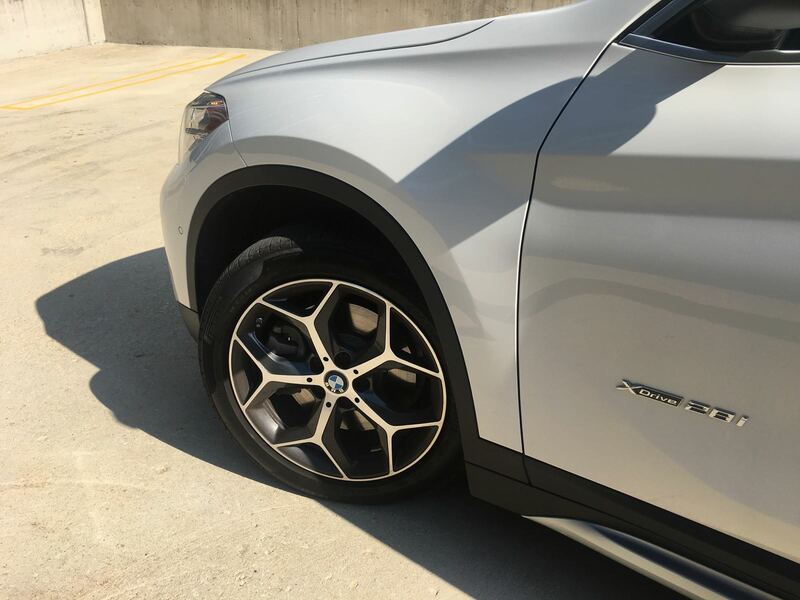 The X1 has a slower steering rack with a ratio of 15.7:1 vs the Clubman’s 14.1:1 making inputs and reactions feel noticeably slower and more deliberate in the BMW. 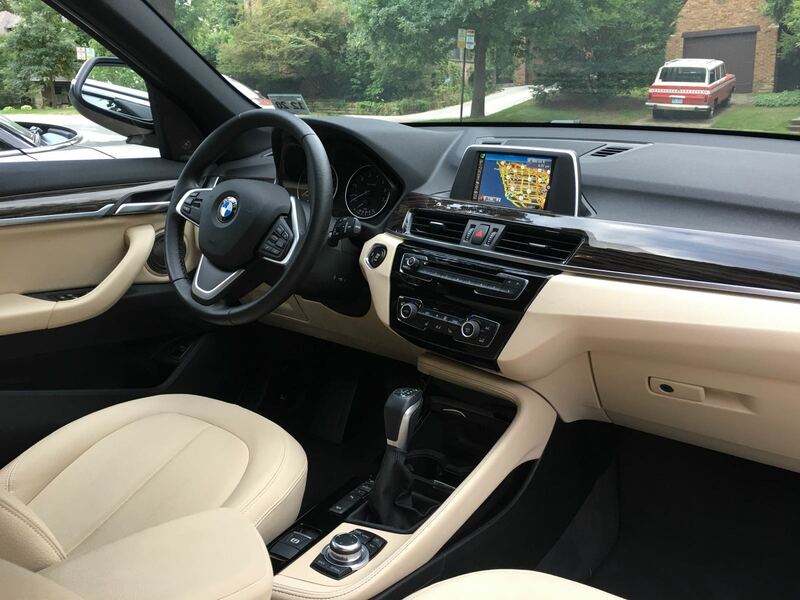 Our X1 28i xDrive came fairly well equipped (you can see for yourself here) at just under $44k compare to our better equipped Clubman which cost just over $37k. 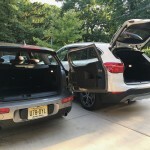 Granted the X1 has a few higher quality components compared to the Clubman (the larger sunroof and powered tailgate are a few examples) but it’s hard to get past the pricing differences given how similar these cars are. Then there’s what’s missing on the $44k X1. Fun size navigation and sport seats were the biggest omissions. 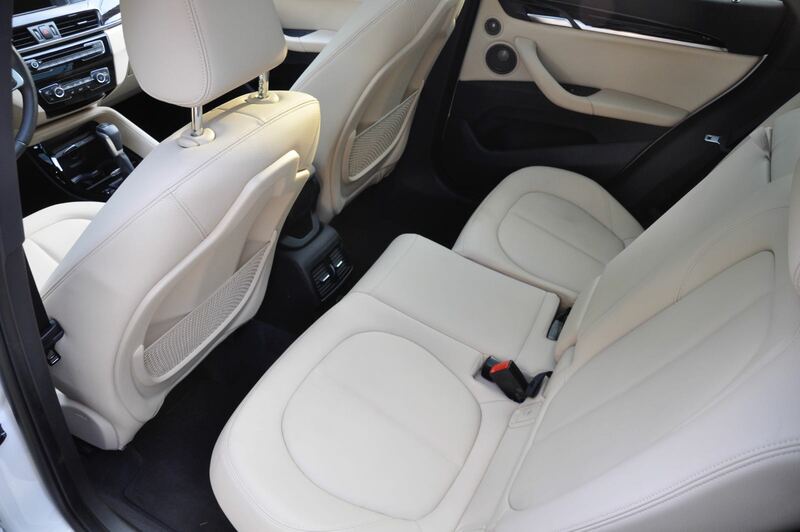 Speaking of those seats, the standard X1 seats our test car had are identical to the standard MINI seats normally not found in anything but the most base Cooper models. I had forgotten truly how mediocre they are offering very little support in almost every measurable way. At 6’2″ they felt more like a perch offering little thigh support. The fact that MINI offers them standard on a sub $30k Cooper S and BMW won’t throw them in without the M Sport package (or as a $400 option) seems like an overly cheap move. 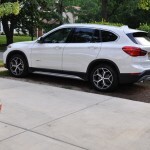 The X1 does take advantage of it’s front wheel drive roots. Compared with the previous version it’s both shorter and taller allowing for better visibility and more room in tighter quarters. 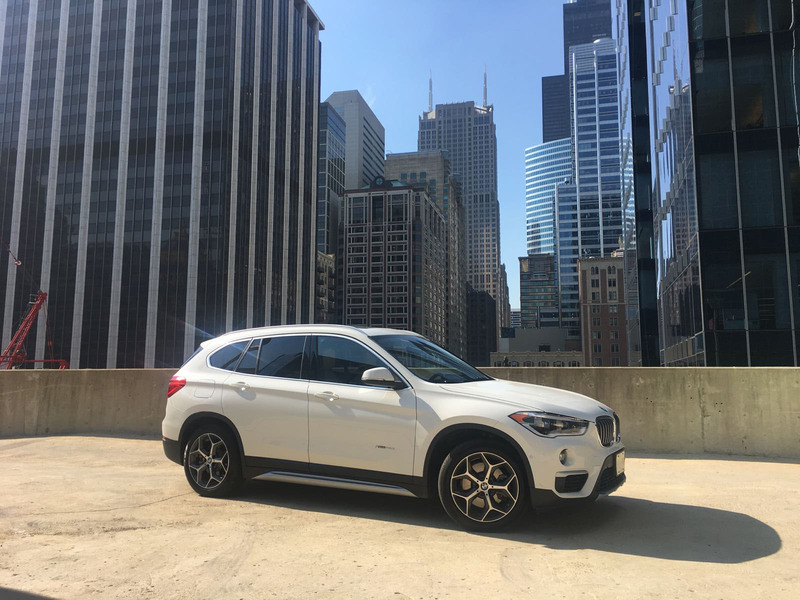 It’s also shod with more tech-like adaptive cruise and self parking which is quickly becoming mandatory in the small premium crossover market. Yet nothing can hide the X1’s MINI roots. They’re great roots. We at MF love the recent UKL based MINIs. But applying a BMW badge (and brand) to the UKL front wheel drive platform doesn’t make it a BMW. 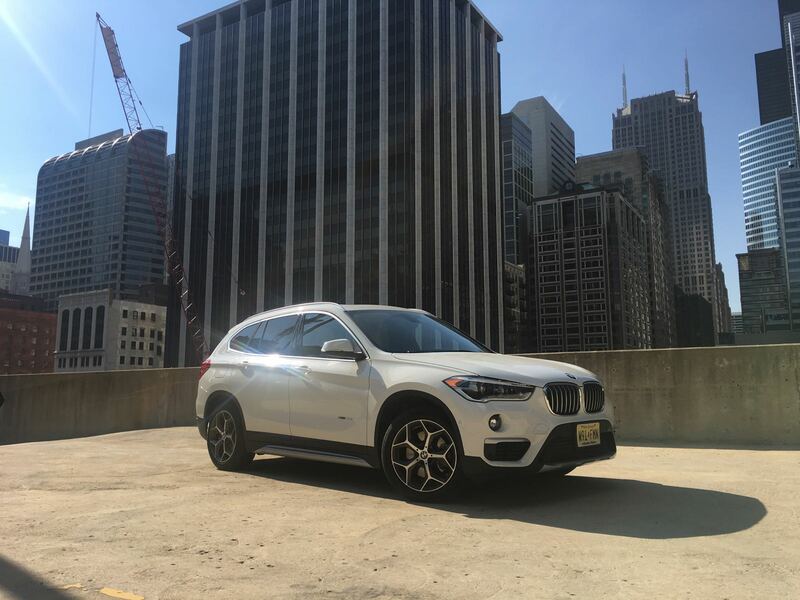 The X1 feels like a thoroughly transformed MINI rather than a successor to the previous 3 Series based X1. 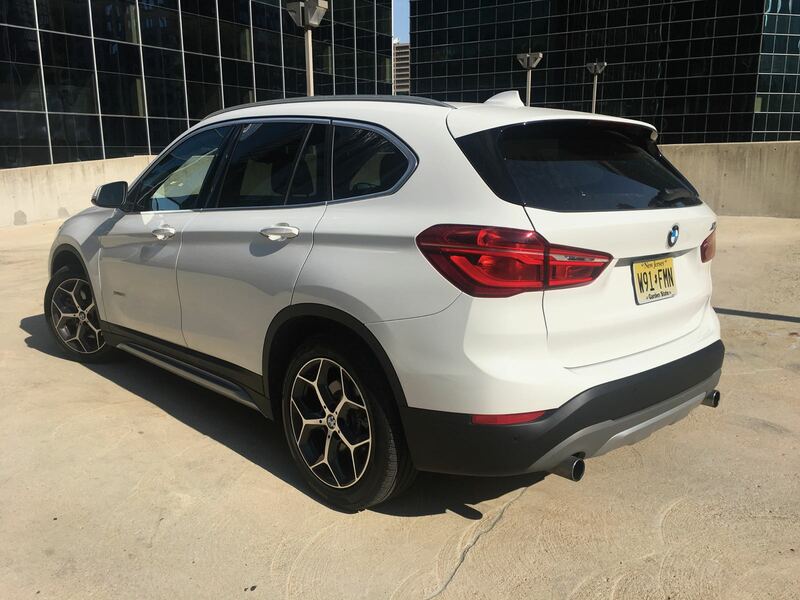 There’s less feedback through the wheel and the balanced rear wheel drive feel that the old X1 delivered is simply not here. 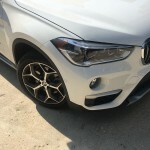 The driving experience itself feels less fluid than before with the vast majority of the power going through the front wheels rather than the rear. 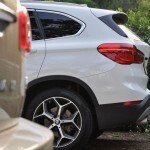 Yet the X1 is entirely successful within its segment. It’s confident and nimble with well-weighted controls and competent performance. 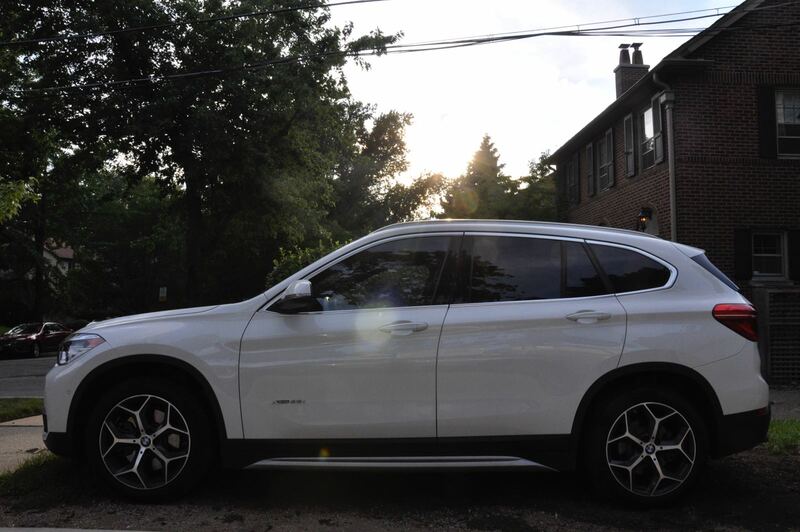 Compared to a Audi Q3 or even a Suburb Forester it feels more driver-oriented. 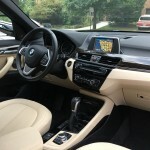 But the driving experience is decidedly different than driving E84 X1, and not necessarily for the better. 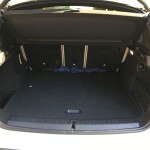 And compared to the MINI Clubman it lacks a more involving driving experience that we know the UK platform can deliver. 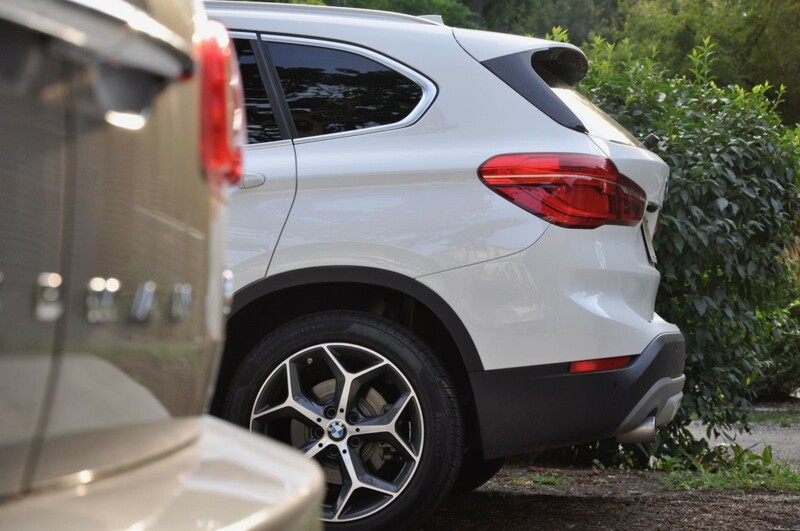 The X1 adds some space and an additional dose of premium but it never quite makes a clear case for its higher cost in terms an enthusiast driver could get behind. 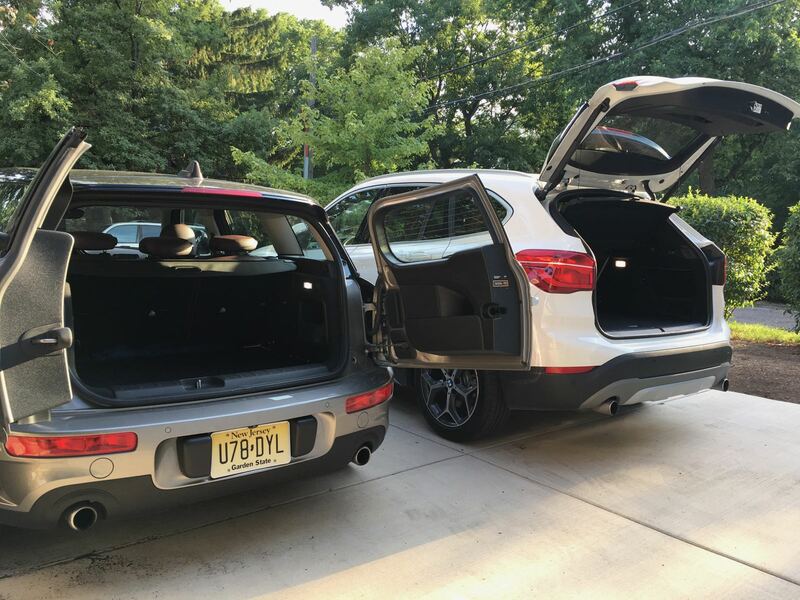 After a week with both of these cars a couple things became evident. First the Clubman is simply a better MINI than the X1 is. Secondly and perhaps most damning, it may just be a better BMW than the X1 is. 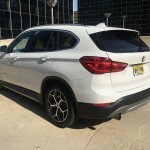 The Clubman endears itself to the enthusiast driver in ways the X1 doesn’t seem interested in with more responsive steering, more driver oriented suspension settings (even in stock form) and 425 lbs less to lug around. Despite the X1 having 39 hp more than the Clubman, the X1 never rewards the driver the way the MINI does. For our money the extra room and luxuries that it delivers can’t overcome that. I have often recalled your memorable ‘selfie’ taken of you and your travelling companion – both dressed-up like abominable snowmen – while driving an open top MINI Roadster in Chicago in mid-winter. Your article extolled the virtues of the Roadster as an all year round proposition, and you concluded that the Roadster was the best handling and most enjoyable MINI in the range. The Roadster, together with its sister Coupe, proved to be a spectacular commercial flop. Sometime later, you drove the MINI Paceman at its launch, and again you extolled its virtues, concluding that the Paceman was what the Countryman should have been from the start. The Countryman has consistently been the second best selling, and the most profitable, R-Series MINI. The Paceman on the other hand proved to be another spectacular commercial flop. It all supports my point. This is an enthusiast site and this has a editorial bias towards things that enthusiasts prefer. However I have always been very clear about business needs and broader success vs the niche vehicles you mention above. Again this all proves the point I made in the article above. I’m also not sure you’re point works given that we also really enjoyed the Countryman. Btw not sure what selfie you’re referring to but that doesn’t sound like me. My comments were not meant to be taken too seriously, hence the smiley. 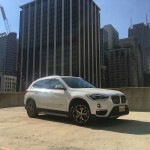 In any case, MF was not alone in extolling the virtues of the Roadster and Paceman, and none of us could have anticipated how unsuccessful they would be, from a commercial standpoint. The new Clubman is a worthy car, and very handsome except for the front. A case of “nice body- shame about the face”. I think it will sell steadily, but it won’t break any sales records. 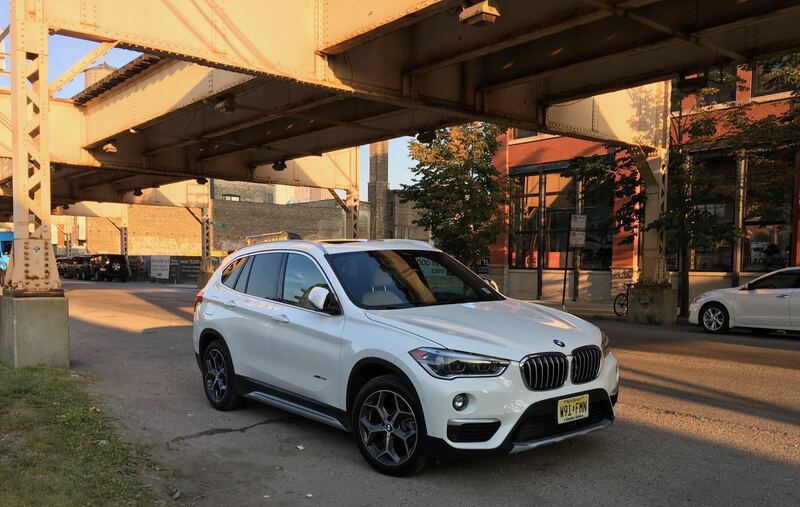 The X1 on the other hand is already breaking records. BTW I’ve just been searching for that photo, but can’t find it. It was definitely on MF, and I assumed that it was you and Nathaniel, but the faces were more or less covered. Oh it was Nathaniel. Now I remember. <—- Although this photo was in the MINI Roadster. Can’t deny that. Ha!